This is our guide to the golf courses close to Suvarnabhumi Airport in Bangkok if you want to play a course on the day of arrival or departure. For those who have enjoyed a golf holiday in Thailand, Suvarnabhumi is a name you may know well. Everyone who lives outside the country and starts their Thailand golf adventure in Bangkok will have landed at Suvarnabhumi Airport. Even if you plan to travel further afield in Thailand during a golf break, Suvarnabhumi could be your starting point if arriving from outside the country. While it may be tempting to immediately leave this region of Thailand, there are some top Suvarnabhumi golf courses which demand your attention. If you are landing at Suvarnabhumi Airport following a long flight, why not rest for a couple of days in a hotel and play some of the tremendous golf courses in this area of the country? In addition, you could always plan a few rounds of golf in Suvarnabhumi before your leave Thailand. When planning to play golf in Suvarnabhumi be aware about the debate regarding the location of the place itself. The location of Suvarnabhumi has been debated many times and it is best not to get too involved in this aspect and think of it more as the region surrounding the airport rather than anything else. When planning to play the golf courses near Suvarnabhumi, you must consider the climate and the best time to travel. The peak period for playing golf near Suvarnabhumi is November to February. This is known as the cool season, with cooler temperatures than the rest of the year yet remaining warm and dry. The hot season is between March and June while you will find the most rain between July and October. However, whatever time of year you travel, you will find many nice days to enjoy spending time on the golf courses near Suvarnabhumi. You are spoilt for choice when it comes to playing golf near Suvarnabhumi and you could spend weeks here and never get bored of the challenges. 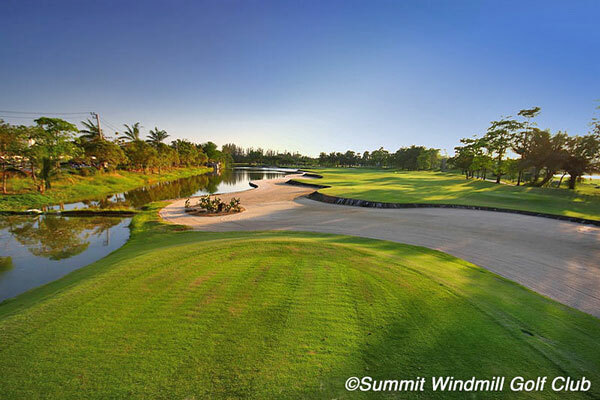 One of the top golf courses near Suvarnabhumi is Summit Windmill Golf Club. 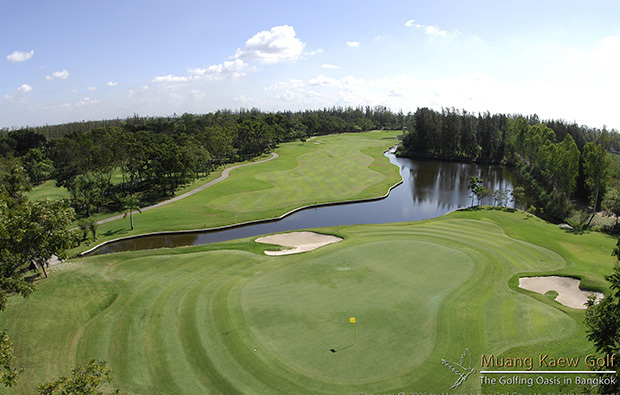 This golf course was designed by Nick Faldo and opened for play in 1993. It is located just 30 minutes away from central Bangkok, towards the Suvarnabhumi Airport. Despite the fact it is close to both the airport and city, Summit Windmill Golf Club has the feeling of nature thanks to the surrounding parkland and wildlife. Water has been used heavily in the design of this golf course and if you are feeling a little sleepy following a flight, you will soon have your wits about you playing Summit Windmill Golf Club. While the overall course is not particularly long, the first hole plays to 624 yards and that is a significant distance to start the round. The par-3 holes are well protected by water and the 12th hole features an island green, where accuracy is key. With plenty of elevation and hilly fairways, this course has been carefully sculpted to offer a good challenge and the clubhouse is magnificent. Arguably one of the best in Thailand, it looks more like a castle than a clubhouse and there are restaurants and five star accommodation available. You could easily spend time playing at Summit Windmill Golf Club before catching a flight from Suvarnabhumi Airport the following day or later the same evening. From one golfing legend to another and for a lovely round of golf near Suvarnabhumi you should book a tee time at Thana City Country Club. This golf course was designed by Greg Norman and is the only course in the country designed by the Shark so take advantage of its proximity to Bangkok and Suvarnabhumi. If you have never played a round of golf close to an airport, you are in for a real treat at Thana City Country Club. The course is so close to Suvarnabhumi Airport that planes can seem as though they are going to land on the fairway. However, there is much more to Thana City Country Club than its proximity to the airport. The 6,966-yard par-72 course has played host to some of the biggest golf tournaments in Thailand including the Thailand Open, Thailand Ladies Open and the Johnnie Walker Super Tour. Some of the biggest names in golf have walked the fairways of this course including Vijay Singh, Ian Woosnam, Laura Davies and the man himself, Greg Norman. Both the course and the clubhouse have received several improvements in recent years and there is plenty of variety across the 18 holes. 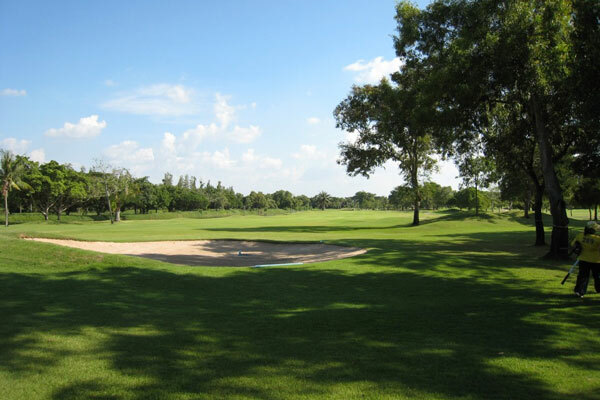 The fairways may be fairly flat throughout but with lakes, streams and well placed bunkers, Thana City Country Club is a good challenge to players of all abilities. There are four island greens in total, so accuracy on approach is very important if you want to score low. Complete with a modern clubhouse, driving range, pro-shop, golf academy and swimming pool, Thana City Country Club is one of the top golf courses near Suvarnabhumi. One of the most popular golf courses near Suvarnabhumi due to its location close to Bangkok and the airport is Muang Kaew Golf Club. However, if you are expecting an easy ride on this golf course you will soon change your expectations once you get started. Muang Kaew Golf Club may be popular for those having just landed or about to leave Thailand via Suvarnabhumi Airport but it differs to many of the other courses nearby thanks to the elevated greens. This is something you will rarely find on golf courses in the Bangkok region as they tend to be mostly flat, so Muang Kaew Golf Club offers a different challenge. While the greens many be difficult due to their elevation and protection from sand and water, the fairways at Muang Kaew Golf Club are a little more forgiving. The fairways are mostly wide and tempt players to get out the driver. Accuracy is not paramount on many of the holes but with the tricky greens, planning ahead to the approach shot is the best play. The back nine is considered the best at Muang Kaew Golf Club and at one point players go under the highway and face a blind tee shot. Also, beware the water on the 18th green. You will not see it from the fairway and many players end up dropping shots at the last having not taken care on their final approach shot. Following a round of golf at Muang Kaew Golf Club, head to the restaurant which has received many positive reviews for its western style food. This is one of the top golf courses near Suvarnabhumi and Muang Kaew Golf Club makes a great place to start or end a Thailand golf holiday. If you are really pushed for time and want to fit in one more round of golf before travelling to the airport, Royal Golf and Country Club is a great choice. This golf course is just 5 minutes away from Suvarnabhumi Airport and 30 minutes from Bangkok, meaning you can enjoy a round here before or after flying and travelling into or out of the city. The golf course was designed by Japanese designer Chohei Miyasawa with the aim of using the natural environment and producing a scenic round of golf. Miyasawa has certainly achieved his goal with Royal Golf and Country Club and there are many lovely flowers, trees and plants around the 18 holes plus canals which wind their way between each of the holes. In addition to the nature, there are many spectacular homes which can be seen from the golf course, including the Thai prime minister's house from 2006. So, you are in good company when playing a round at Royal Golf and Country Club. One of the key features of Royal Golf and Country Club are the long par-3’s and these are regarded as being some of the toughest ‘short’ holes in Thailand. The 17th is 230 yards long and for beginner golfers this can be daunting, meaning a longer club which is not always easy to control. The par-5 15th hole is a little different in that accuracy is more important than distance thanks to the water which runs the length of a narrow fairway. The greens are one of the most impressive aspects of the Royal Golf and Country Club. They are kept in great condition throughout the year and you will struggle to find a better selection of high quality greens anywhere in this region of Thailand. With a good clubhouse and practice facilities, Royal Golf and Country Club is a great place for a round of golf near Suvarnabhumi. Its proximity to the airport is an added bonus to those who are catching a flight. 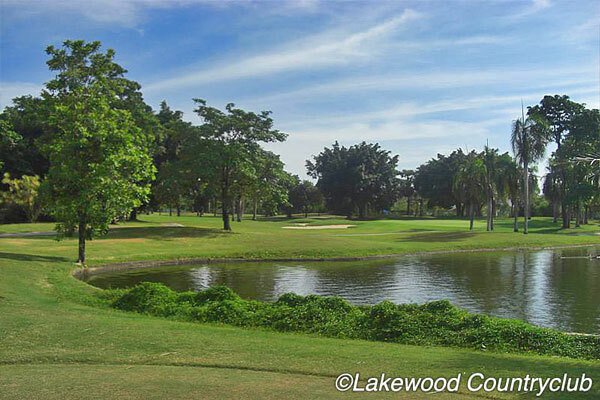 The final stop on our tour of golf courses near Suvarnabhumi is Lakewood Golf and Country Club. 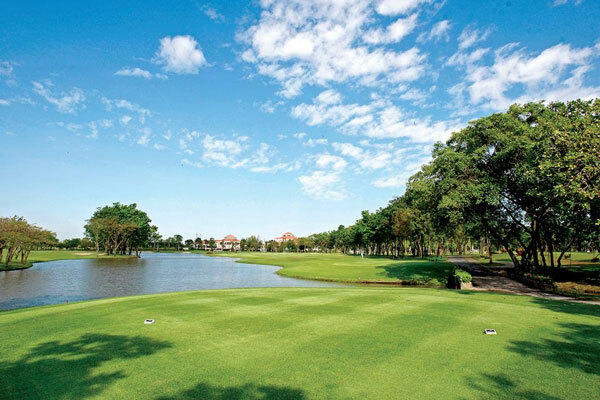 Close to Suvarnabhumi and just 30 minutes away from Bangkok, this is another golf course that boasts a great location. There are three sets of nine holes at Lakewood Golf and Country Club and you combine any two of the Lake, Wood and Rock courses to make an 18 hole round of golf. Much of the course is flat but there are many plants and trees which add to the overall experience of playing at Lakewood Golf and Country Club. There are some greens on each set of nine holes which have undulations but none of them are severe enough to be troubling to seasoned golfers. Thanks to an effective drainage system and the work of the staff, the Lakewood Golf and Country Club is kept in tremendous condition throughout the year. This makes it a great addition to a Thailand golf itinerary whatever time of year you travel. The fairways are wide and you will have fun using the driver on this course but be aware the ball does not roll a great distance unless the course is very dry. Therefore, some of the holes can play a little longer than they first appear. The par-3 holes are considered by many to be some of the best of any golf course near Suvarnabhumi and the caddies will save you many shots thanks to their impressive knowledge of the course. You can choose to hire a buggy at Lakewood Golf and Country Club but with little in the way of hills, you can have a great time walking this golf course if you have time. The clubhouse was designed by a 5-star hotel architect and features a restaurant, locker room, pro-shop and spa. You could enjoy a fantastic round of 18 holes and relax in the spa followed by a great meal. If you are heading to the airport, it’s a great way to play golf before your journey and Lakewood Golf and Country Club comes highly recommended. There are many excellent golf courses near Suvarnabhumi that you could land at the airport and do a tour of these courses before heading home again. While you may want to venture further into Thailand during a golf holiday, the golf courses near Suvarnabhumi make a great addition to any Thailand golf itinerary and each could be used to begin and end a golf trip. Some even offer accommodation so what better way to start and end a golf holiday in Thailand than playing one or more of the golf courses near Suvarnabhumi?